The Niagara Falls Cottage Lodge is conveniently located on the outskirts of Niagara Falls, Ontario, close to both the Queen Elizabeth Highway and scenic Highway 20. Despite our rustic country setting, we are just minutes by car from the world-famous Falls and associated attractions, Clifton Hill with its exciting rides and museums, and Niagara's casino complexes and night life. 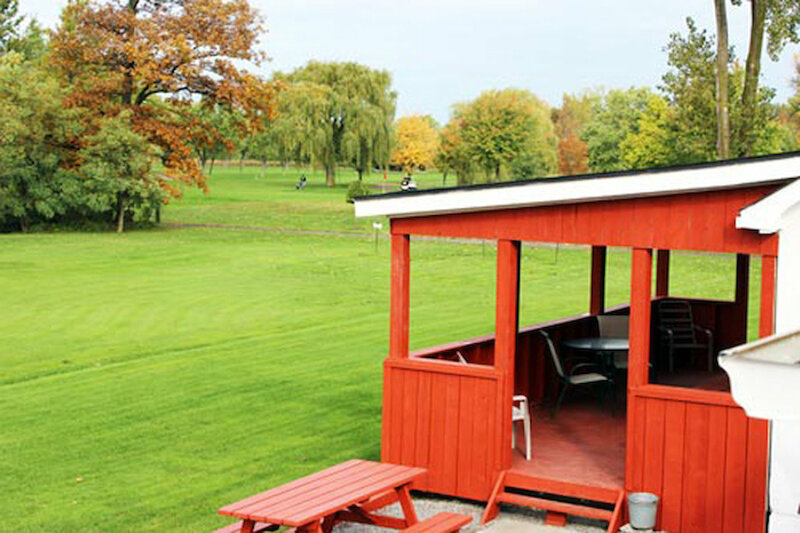 Situated on picturesque country acreage adjacent to one of Niagara's beautiful 18-hole golf courses, our property offers a unique private setting for your group get-together and a great low-cost alternative to hotels. Our lodge is a lovely old manor with attached carriage house that has been converted into warm, casual, comfortable accommodations for large or small groups. There is lots of free parking available, and we are just one block south of the Sundowner Hotel and the Casino Shuttle Station. Everything is maintained in immaculate condition, inside and out, and we strive to provide a relaxed homey feeling. We can accommodate groups as small as 4 people or as large as 29 ... or even up to 50 with our 2 additional cottages. We offer an economic alternative to high priced hotels for groups visiting the Niagara area. With full kitchens, games rooms, and livingrooms with big-screen TVs, our rentals provide a private place to unwind and relax after a day of fun and excitement, and the option to avoid or reduce expensive dining out. Additionally, with its pool and poker tables, horseshoe and fire pits, patios and barbecues, it is a perfect atmosphere for your group to get down and party in a private setting without the worry of disturbing other guests. For groups of 15 to 29 people, our main guest lodge is the perfect large group accommodation, providing 13 queen-sized beds plus a total of 6 double futons. It also offers a full kitchen, livingroom/lounge and well-equipped games room complete with full-size pool table, and two full bathrooms. Ideal for groups of 4 to 8 people, the lower loft has 2 bedrooms, one with 4 single beds and the other with 1 queen-sized bed and 1 single. 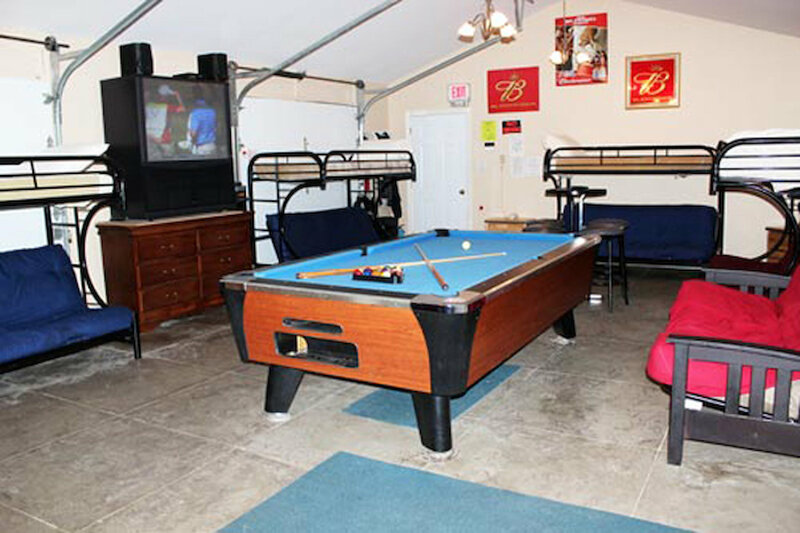 The large livingroom/lounge is equipped with a full sized pool table, stereo, big-screen TV, bar, refrigerator, plus a bunk bed and a futon. There is one 3-piece bathroom in the lower loft. Ideal for 4 to 8 people, the Upper Loft offers 2 bedrooms, each with 2 queen-sized beds. There is also a full bathroom, a kitchenette, and a livingroom/lounge with TV and 2 double futons. The "Bonus Room" is not a rental on its own, but is used as an "add-on" to provide extra space for any of the above rental units. 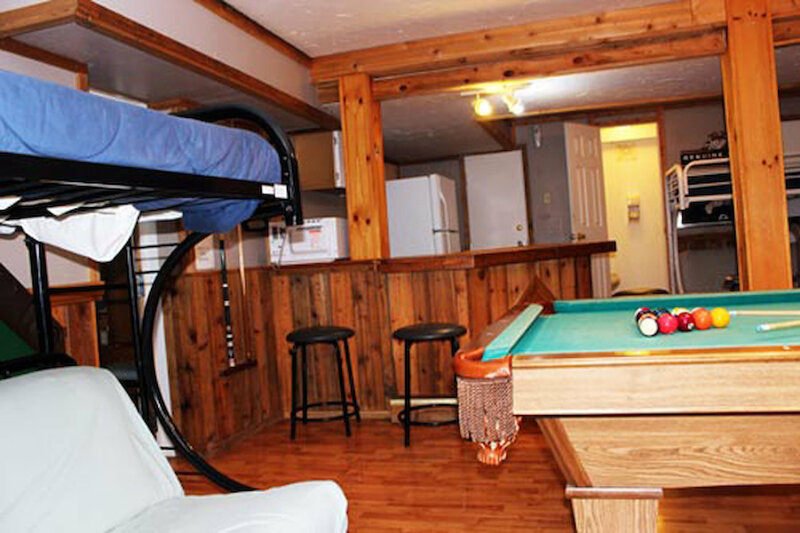 It consists of a large livingroom/lounge with 4 bunk beds, a refrigerator, a pool table and a big screen TV. It has its own 3-piece bathroom. It is ideal for those renting the Upper Loft who may want the use of a TV or pool table, or more sleeping area, especially for private events such as stags or New Year's Eve parties. Outdoors our guests will find covered patios and decks with tables and chairs, horseshoes and fire pits, gas BBQs and a relaxing country atmosphere.